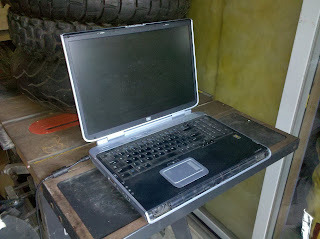 I'm going to continue with the theme of clearing out under-utilized computer hardware. Next on the block is a 2004 era Microsoft Media Center laptop. Surprisingly, this one still works well due to a RAM boost that I gave it 2 years ago. The guy that came to pick up yesterday's computer took this one too. After reading a New York Times article on the correlation between happiness and material possessions, my sister, fiance and I have decided to do a little paring of our worldly goods. For the next 100 days, we will each give, donate, dispose of or sell an item from our personal stash of belongings. By November 15 we will collectively be 300 possessions lighter and, hopefully, better for it. 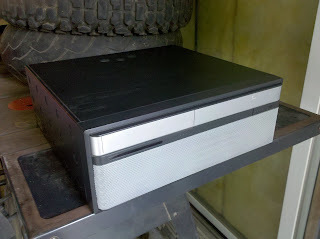 Today is day one and I am getting rid of a Media Center PC that was custom built in 2006. About half a year ago it gave me the blue screen of death. It's possible I could fix it but I haven't tried. It's free, if you want it. Lancaster, PA -- Ted Houser, owner of Ninja Fast Consulting, is joining a team of riders supporting Tabor Community Services at the 15th Annual Dream Ride Lancaster bicycle century, July 24, 2010. 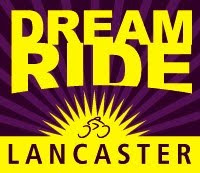 Dream Ride Lancaster is an annual fundraiser that enables bicycle riders to raise financial pledges to advance the work of local charities. Ninja Fast is riding for Tabor Community Services in support of Beth Shalom, a transitional housing program for single mothers leaving prison. Fifty-five percent of women in prison have a child under the age of 16. Beth Shalom provides a stable environment for these children to be reunited with their mothers. Houser is training the entire month of July in order to support these disadvantaged families by riding 100 kilometers on the 24th. You can support single mothers and their children right now by making a simple donation on the Tabor website. Scroll down to enter your donation amount next to the heading, "Dream Ride 2010: Ted Houser." "It's time to get Ninja Fast," says Houser. "I'll do my part on the 24th. Let's see you ninja up and do yours now..."
Built a new bike this weekend that I'm calling "The Man Bag" in tribute to a color scheme that would be equally at home inside of a cupcake shop as it is on this bicycle. The Man Bag wiggled into my life last week when I discovered an old Raleigh Technium hanging in my soon to be father-in-law's garden shed. Obscured by 20 years of dust and lawn mower exhaust, the true condition of the bike was difficult to determine. 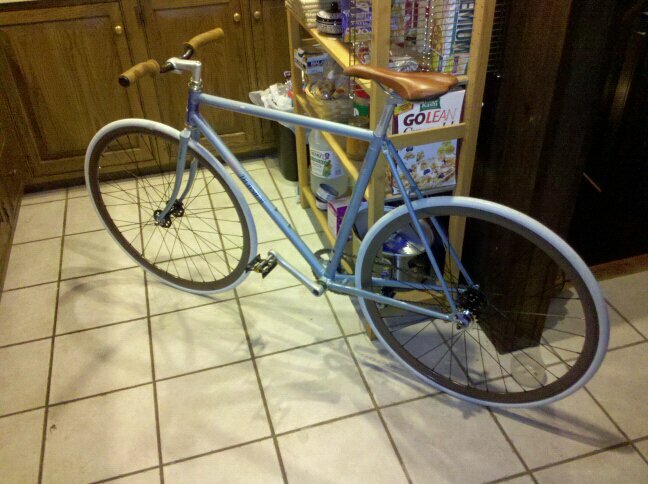 I was nonetheless drawn in by the butted aluminum frame with internal cable routing and multiple shades of baby blue. This was more than a department store cruiser. As I studied the decades-old pedaller hanging upside down above the snow blower, I saw potential for a grand polo machine or, at the very least, a fixed gear bicycle with enough street cred to validate any rider in skinny jeans and a welding cap. So I asked for it. And it was given to me. The bike originally belonged to my girlfriend's brother. It was no doubt purchased with lawn mowing earnings in the 80's and ridden with tube socks for the first 400 miles of it's life. But it has hung undisturbed in a 12'x20' shed ever since. One wheelset and one trip to Cycle Circle later, I amassed the pile of bits and pieces that created the baby-blue chocolate sensation that you see before you today. I tend to over-invest in projects that look simple from the get go. And this build was no exception. With a single/fixed flip-flop hub and bars cut down for polo, this machine is ready for the hard court. 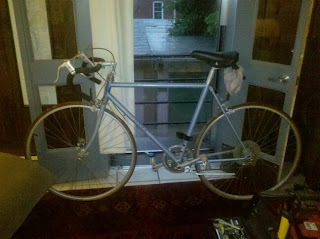 But something tells me this bike is going to spend more time locked up outside of local pubs and eateries. And for a bicycle named The Man Bag, a life of coffee shops and street festivals may be the most appropriate of destinies. The Man Bag is simply too pretty to be subjected to repeated lashings with a mallet. This ride will be more at home when paired delicately with a shade tree, soy latte and a fresh cupcake. Perhaps we should toss this one to the skinny jeans. 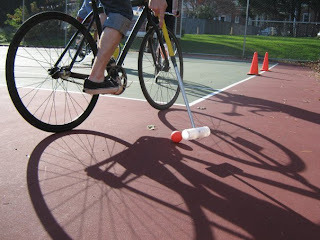 This spring I discovered the sport of bicycle polo. I like it. A lot. So much, in fact, that it has made previously enjoyable activities such as mountain biking and poking friends on Facebook seem mundane. If you've never encountered the sport before, imagine a version of equestrian polo played with a bicycle instead of a horse. 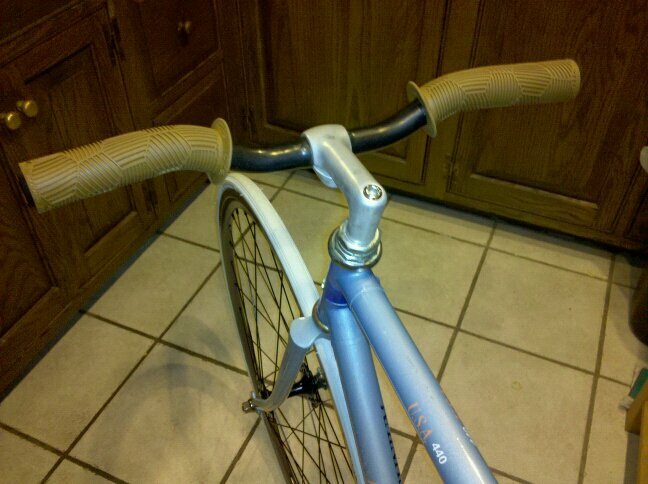 Add to that blood, frequent crashes and a sub culture born from the urban fixed-gear bicycling community. But picture the guys who actually ride their fixed gear bikes, not the ones who just lock them up outside the coffee shop. 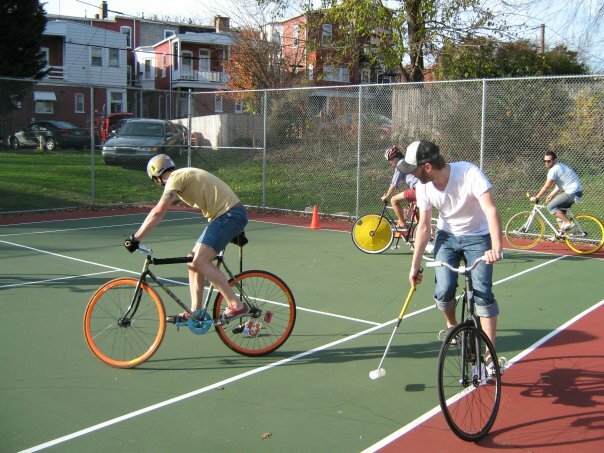 Bicycle polo provides community, exercise and fun on two wheels through one tidy game involving bicycles, an orange street hockey ball and mallets fabricated from ski poles and plastic pipe. 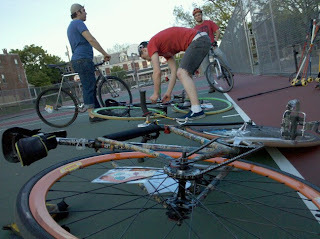 Bicycle polo is like fight club on wheels. Without the aggression. Hardcourt bicycle polo, as played in Lancaster City, involves teams of 2 or 3 men who battle for victory on a tennis court. Goals are established with traffic cones set a bike's width apart from one another. First team to score 5 goals wins. If a rider sets a foot down during the game, he is immediately out of play and must tag in at center court before returning to play. Mallet on bike and mallet on rider contact are both prohibited. Otherwise, pretty much anything goes. I'm hooked on this sport. We play every Thursday night and I find that if I miss a week, I get rammy and grumpy. This video should give you a wink of an insight into how the game is played in Lancaster. It might be noted, however, that the intensity and speed of the game has picked up since I've joined the ranks. This is a great step in the right direction to help bicyclists plan commuting routes. We discussed Google Maps at the monthly bicycle commuters breakfast in Lancaster, PA this morning. It was agreed that the directions produced by this map engine are not always the best. We are hoping that the software is intelligent and will improve with time based on rider feedback. Knowing Google, we trust that it will. An excellent book by Jeff Mapes, Pedaling Revolution is an inspiration to the bicycling advocate that provides a detailed historical account of the legislation and community action behind the cities that are widely regarded as Bicycle Friendly. Launched at the 2010 League of American Bicyclists Summit last week in Washington D.C., http://peopleforbikes.org is an initiative of Bikes Belong Coalition to create social community around the love of the bicycle. It's a great idea and I hope it takes off. This blog is about sustainable transportation and fun on two wheels. The author, Ted Houser, hiked the Appalachian Trail in 2008 and now lives without a car in Lancaster, PA.
Ted is the owner of Ninja Fast, a web development and marketing company. Ninja Fast is a proud supporter of the League of Lancaster Bicyclists.